You'll be £20.00 closer to your next £10.00 credit when you purchase Rigging Period Ships Models. What's this? The rigging of period ship models is the most complex task which any modeller has to take on, for an eighteenth-century man-of-war boasted mile on mile of rigging, more than 1,000 blocks, and acres of canvas. To reduce this in scale, and yet retain an accurate representation, is an awesome undertaking. This now classic work untangles the complex web, and, using some 400 drawings, the author shows clearly how each separate item of rigging is fitted to the masts, yards and sails. Each drawing deals with only one particular item so that it can be seen clearly in isolation. The lead of a particular halliard, the arrangement of a bracing line, these and every other detail is depicted with startling clarity. Based on the author's research of numerous eighteenth-century models, each one with its contemporary rigging still extant, the information is both meticulous and accurate. The remarkable visual immediacy and clarity of this work makes it truly unique and no modeller of period ships can afford to be without it at his side. In addition, the book is a 'must-have' practical reference work for all those involved in the rigging and repair of historic ships. It is sufficed to say, a picture is worth a thousand words, and Lennarth Petersson presents just that. Rigging Period Ship Models is a beautifully illustrated manuscript detailing of the entire rigging layout for what was seen on a British Frigates of the 18th and 19th centuries in this book. He shows us fifty-four of the major components that make up a complete rig to these ships, presenting them in an incredibly easy to understand format. This book is an amazing reference for any modeler regardless of skill level. Mr. Petersson set out to create a guide for model shipwrights which focuses solely on the rigging of these ships after realizing there was specific guides in print that show all aspects to how these ships were rigged; he did exactly what he set out to do! 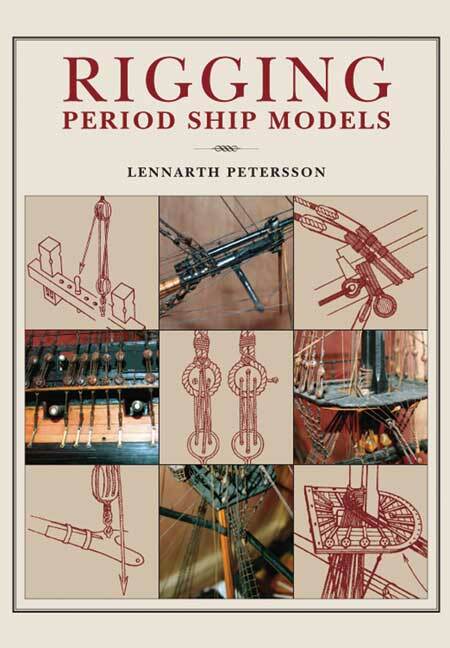 This is definitely a must-have for any modeler looking for information which illustrates period ship model rigging. Every single example of how a piece of rope might be used in the many roles required on such ships is carefully described by those excellent line drawings which are remarkable for their overall simplicity. All mast and sail configurations are included - making the work relevant for any period model ship. This book is a 'must-have' practical reference work for all period ship modellers and for all those involved in the repair and rigging of historic ships. A truly excellent volume and thoroughly recommended. 36-gun, 18-pdr frigate Melampus, a fully-rigged model of which survives in Bristol, where the original frigate was built by Hillhouse and launched in 1785. It is the drawings and diagrams that are the essence of this work, individually showing every item of this work, individually showing every item of standing and running rigging, its lead, belaying and fastening, as necessary. Some 200 of these provide invaluable rigging information for the modeller, the historian or student of the naval ship period. A superb and practical work that has already been appreciated by many of our readers. A study specific for naval modellers using wood, with a reference that can be used quickly and easily. Without a doubt, this is a masterpiece and if you are a naval modeller, you need to have this in your library. The visual immediacy and clarity of this work makes it truly unique and no period ship modeller can afford to be without it at their side. In addition, the book also serves as a 'must-have' practical reference work for all those interested in, or actually involved with, the rigging and repair of historic ships. Most modelling books deal in detail with hull construction, and give at best a general guide to the rigging...this book presents some 250 drawings with such clarity and detail that there is no need for explanatory text. The publishers have produced a excellent edition which complements in its quality the first class drawings. The book should appeal not only to modelmakers, but to all those interested in the workings of a man of war in the latter half of the 18th Century. This book presents some 250 drawing with such clarity and detail that there is no need for explanatory text. An excellent edition which complements in its quality the first class drawings. The book should appeal not only to modelmakers, but to all those interested in the workings of a man of war in the latter half of the 18th Century. This is a must have reference book for the period ship modeller.